Walking is a major developmental milestone. Each baby walks at a different age and it can happen anytime between 9 and 15 months. 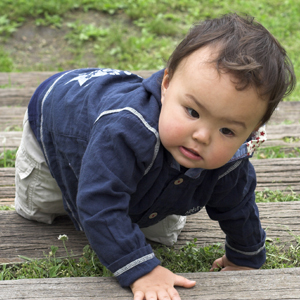 Walking is often the step after crawling and cruising have been mastered. Putting shoes on baby that is learning to walk could get in her way. Let your baby be barefoot if possible when she is crawling and cruising. Let your baby walk barefoot on different surfaces like grass, sand, tiles and carpet. This will be fun for her and will also teach her what different surfaces feel like. You don’t have to hold your baby’s hand while she tries to walk, rather let her find her own balance. Put your hands on her waist to keep her upright and then encourage her to walk. If your baby is not showing an interest in walking by 15 months, talk to the doctor. Understand simple phrases such as "baba" and "bye-bye"